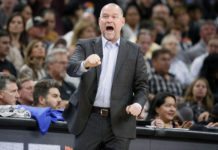 The Valley View Casino Center in San Diego will always be remembered as the home of LeBron James’ Los Angeles Lakers debut, but let it never be forgotten that the Denver Nuggets spoiled that debut with a 124-107 thrashing of the purple and gold. 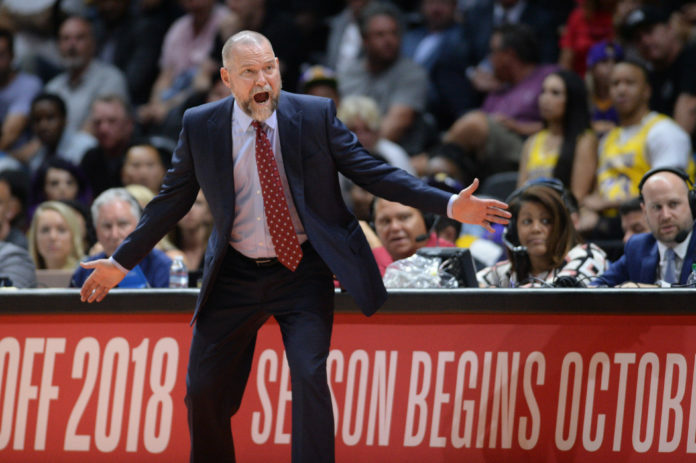 After going through training camp all week at San Diego State University, the Nuggets got off to a great start by defeating one of the NBA’s most decorated franchises. In a stadium packed full of Lakers fans, the Nuggets played resilient and looked the part of team poised to end a five year playoff drought. With Gary Harris missing the game because of a hamstring strain, the Nuggets rolled out a starting lineup of Jamal Murray, Torrey Craig, Will Barton, Paul Millsap, and Nikola Jokic. That five-man unit got off to a solid start building a 66-54 lead going into halftime. Jokic and Murray excelled offensively with the other three starters playing solid complimentary basketball around them. The second half is where the starters got a little rough as the Lakers began the third quarter on a 11-1 run. After weathering the storm before handing the game over to the second unit, Murray and Jokic continued their solid nights before being pulled with the rest of the starters for the remainder of the game. Tonight gave us our first look at Barton starting at the three, but we still didn’t get the full effect with Harris being held out. Each starter played at least 19 minutes with Barton leading the way with 24. Murray finished the game as the Nuggets second leading scorer with 18 points after shooting 8-12 from the field and 2-3 from behind the three-point line. As far as the rest of the starters, Jokic posted the second best stat line with 12 points, four rebounds, and three assists. 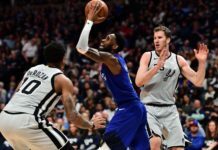 Barton followed with seven points and two rebounds, while Craig scored three points and hauled in four rebounds. Those are not fantastic numbers for the Nuggets starters, but counting stats don’t always tell the whole story. The first unit showed flashes of how great they can be, but they also had weakness. Luckily for Denver, there is still plenty of time to work out the kinks with the regular season a couple weeks away. After missing 44 games last season with a wrist injury, Millsap seems to be back at full strength. After coming back near the end of last season not near 100 percent healthy, Millsap looks to be making his way back to the player he was before the injury occurred last season. Going into his second season with the Nuggets, the chemistry developed during training camp and the preseason will pay huge dividends for the Nuggets in the long run, and will help Millsap get back to the player he was when he was an all-star just two seasons ago. The biggest thing that stood out in Millsap’s performance on Sunday wasn’t his six points on 1-5 from the field, but it was his effort on the defensive end of the floor. Millsap showed why he’s arguably the Nuggets best defender leading the team with two steals and blocking a shot. Juancho Hernangomez was one of the first players off of the bench and he made his presence known immediately with high level shot making. Hernangomez ended up leading the Nuggets in scoring with 19 points, and he drilled five three pointers in the process. After missing out on most of last season due to mononucleosis, Hernangomez is finally healthy and it showed on Sunday night. That sweet shooting stroke we saw all of his rookie season was on full display as Hernangomez was nailing triples from all over the floor. If Juancho continues to shoot like this as the preseason rolls on, he may force Malone to find minutes for him in the rotation. Adding a scoring weapon like Hernangomez off the bench is something the Nuggets sorely lacked last season, but won’t this year. With the addition of Isaiah Thomas, resurgence of Trey Lyles, and reemergence of Hernagomez, the Nuggets bench unit could be one of the best the NBA has to offer. After the starters did their thing for around 20 minutes or so, it was up to the Nuggets bench unit to deliver the goods and spoil LeBron’s Lakers debut, and they did just that. The bench unit combined to score 76 points, while the Nuggets starters scored just 48. Denver’s bench unit consisted of Monte Morris, Malik Beasley, Lyles, Hernangomez, and Mason Plumlee for most of the game. Each of the Nuggets bench players did something special, led by Hernangomez’s scoring. But, Juancho’s scoring wouldn’t have been possible if it was not for the players around him making plays. Morris showed his ability as a back up point guard scoring 12 points, hauling in six rebounds, and dishing out four assists. Morris also played the most minutes of a any player on the roster and did a phenomenal job taking care of the basketball and making plays whenever he was on the court. Complementing Morris and Hernangomez was Plumlee, Lyles, and Beasley, who all had solid nights of their own. Plumlee scored 11 points and led the Nuggets with eight rebounds and six assists. As a cherry on top, Plumlee also went 5-5 from the free-throw line (Mark Price is already a Nuggets coaching legend). Lyles followed suit pouring in 14 points, dishing out four assists, and hauling in seven rebounds. Beasley rounded out the group with 12 points on 4-8 from the field, with all four of those makes coming from behind the three-point line. There’s no way around it — the energy and tenacity from the Nuggets bench unit is why they won the game. Going into the game, all the hype was around James making his Lakers debut, and rightfully so. He is one of best basketball player of all-time, but that didn’t stop the Nuggets from putting their foot on the gas from the opening tip and forcing the Lakers to play Denver’s style of basketball. In what ended up being an unbelievably fast-paced game, the Nuggets were the aggressors and showcased how deadly their offense can be. There were a few spurts and lead changes here and there, but there was never a doubt who was going to win this game as the Nuggets were in complete control. 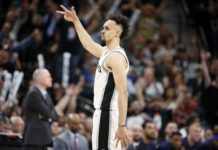 Those are the types of things you want to see from this Nuggets team; a swagger and confidence to get the job done no matter whats going on around you. In a stadium full of people rooting against you, the Nuggets didn’t care. They used that energy and applied it to their play on the court, which led to a huge victory in a hostile environment. Sure, it was just a preseason win, but it is still a strong start of what Denver hopes to be a successful season. With expectations at an all-time high, starting the season off on the right foot is a huge deal, and it’s hopefully something the Nuggets can follow up on Tuesday when they face this same exact Lakers team in Los Angeles.